So what exactly are fructans? ​How do fructans appear on a hay/grass analysis? Does fructan/OF overload cause endotoxaemia? What is the lowest dose of OF that has caused laminitis? Does fructan/OF overload affect insulin? Is pasture associated laminitis SAL or endocrine? ​So pasture associated laminitis is almost certainly endocrine - but could it be due to fructans? ​So where did the idea that fructans might contribute to endocrine laminitis come from? ​So how does grass cause laminitis? ​How much NSC/WSC/ESC/fructan is in grass? What about fructans in hay? ​How reliable is fructan analysis? ​How much fructan could horses consume? Laminitis has been caused by administering large amounts of oligofructose/inulin (a type of fructan) by nastogastric tube. However, does this have any relevance to pasture associated laminitis - can fructans in grass and hay cause or worsen laminitis, and if so, how? During photosynthesis plants make sugar - sucrose, glucose and fructose. When sugar produced > sugar needed for plant growth (respiration), excess sugar is converted into storage carbohydrate. In cool season (C3) grass (as is found in the UK, northern Europe and northern USA), this storage carbohydrate is fructan. Sugar is produced in the leaves, but fructan is stored in the stem, where large amounts can potentially accumulate. Starch is mostly found only in seed heads in C3 grass. In warm season (C4) grass the storage carbohydrate is mainly starch (not fructan), which is stored in the leaves, with limited storage. are water soluble polymers of fructose bonded to a terminal glucose. may be oligofructose e.g. inulin which is found in chicory, with β-2,1 linked polymers with degree of polymerisation (DP) <11; or levans, the predominant fructans found in grass, with β-2,6 linked polymers with degree of polymerisation (DP) 26 or higher. with lower DPs are likely to be more rapidly fermented than those with higher DPs - DP varies between species, e.g. from bromegrass which has 26 DP fructans up to 260 DP fructans in timothy. increase when grass can photosynthesize but can't grow, e.g. during cold weather, drought, and due to lack of nutrients. tend to be highest at the start and end of the growing season, particularly in regions with shorter growing seasons (e.g. further north). are reduced by topping/cutting grass as fructan stores are used to produce new leaves (therefore presumably grass that is grazed at a rate similar to regular topping will reduce fructan levels?). Inulin-type Fructans - Marcel Roberfroid 2006 p40 onwards. How do fructans appear on a hay/grass analysis? Many hay/grass analyses only list Water Soluble Carbohydrate (WSC), which may appear simply as "sugar", and starch. WSC is the sum of Ethanol Soluble Carbohydrate (ESC) (sucrose, glucose & fructose) plus fructan. So fructan = WSC minus ESC. Non-Structural Carbohydrate (NSC) is the sum of WSC plus starch. NB short-chain/low DP fructans may be included in ESC. A more useful definition of carbohydrates for horses would be hydrolysable carbohydrate, i.e. ESC plus starch, or NSC minus fructan, as sucrose, glucose, fructose and starch are digested by enzymes in the small intestine to glucose (and fructose) and influence blood glucose and insulin levels, but fructan cannot be hydrolysed by enzymes in the small intestine, and is fermented by micro-organisms, mostly in the large intestine, to volatile fatty acids and lactate, with the potential for large amounts to cause acidosis. According to Coenen et al. 2006, inulin may be rapidly fermented before reaching the caecum/large intestine. Ince et al. 2013 incubated grass fructan with digesta (contents) from the stomach and small intestine and found that polymeric (long-chain) fructan was partly degraded to oligo-fructan (shorter-chain). The research concluded that fructan in grass is not completely digested pre-caecally and reaches the hind gut, where it is fermented and lactate is produced. When grasses with high and moderate amounts of fructan were incubated with micro-organisms from the hind gut, there was greater fermentation and production of lactate from the grass higher in fructan. Comment: the abstract states that laminitis may be elicted by fructans in pasture grasses - TLS has been unable to find any proof of this, so what do they base this statement on? Given that enzymes and other digestive juices will be produced in vivo in response to the chyme, how relevant is this research? Pre-caecally, was fructan degraded to fructose or glucose (or any mono or di-saccharides) that might have an effect on insulin levels? Was lactate the only product of fermentation of the ryegrasses, or were other VFAs produced? Vosmer et al. 2012 looked at the effects of changing from a hay based diet to a grass (English ryegrass, tall fescue, horse grass mixture, cow grass mixture) or legume (lucerne, white clover) based diet in a model of a horse's hindgut. The grass mixtures contained the highest levels of fructan, with a maximum of 3.75 g/kg, but fructan did not cause a permanent pathological change in the hindgut-flora, even though gas formation and both anaerobic and aerobic bacterial numbers increased following the change to grass/legume. and the molar proportion of acetate:propionate:butyrate was 85:10:3, indicative of fibre fermentation. Acetate is indicative of a diet that is low in rapidly fermentable sugars or concentrates. Lactic acid is an end product of fermentation, but in the absence of readily fermentable soluble sugars in the diet, the lactic acid levels were negligible in the hind gut (0.1 mM), and lower than the small intestine (0.75 mM in the duodenum). NB these horses spent their last 24 hours in an abattoir - it has to be considered that stress could have affected these results. The pasture and hay were not analysed. Interestingly, short-chain fructans may have prebiotic effects. NB Research uses oligofructose, a short-chain low DP fructan (usually Raftilose - an "inulin-like" fructan). Horses given 7.5 g/kg BW OF (Raftilose) by nasogastric tube developed clinical and histological laminitis in at least one foot within 48 hours. None developed colic. Higher doses (10 g/kg BW and 12.5 g/kg BW) were associated with more severe histological laminitis. All but one horse was given flunixin meglumine at 32 h to alleviate clinical signs of endotoxaemia. All horses developed profuse diarrhoea at around 18 h that ceased by 36 - 44 h. Pyrexia and elevated heart rate peaked between 16 and 20 h and returned to near normal by 48 h. Faecal pH began to fall within 4 h of dosing, reaching its lowest value (3.7) at around 18 h. There was significant loss of bicarbonate after 12 h, which remained low for 12 h then recovered. Blood D-lactate of bacterial origin peaked at 24 h at 2.87 mmol/l. Plasma glucose peaked at 24 - 28 h. Cortisol was not greater than controls. Plasma insulin was not significant, although horses treated with 12.5 g/kg BW had the highest values. This research established that a storage carbohydrate other than starch can induce laminitis. OF cannot be hydrolysed in the small intestine, therefore it passes into the caecum, where it undergoes rapid microbial fermentation. Gram positive bacteria, notably Streptococcus bovis and S. equinus, proliferate preferentially and temporarily become the dominant microflora. During OF fermentation Gram positive microflora produce lactic acid, causing the low hindgut pH and peak of blood lactic acid at 24 h (hindgut bacteria produce D-lactate and L-lactate, mammals produce only L-lactate, therefore the presence of D-lactate indicates it has come from fermentation). D-lactate disappeared from the blood by 40 h, suggesting there is a sharp decline in D-lactate producing organisms after an early rapid population explosion. The large but temporary gram positive bacteria could liberate exotoxins and endotoxins when they die off at the end of their growth phase or when the OF is exhausted, which could penetrate the leaky mucosal barrier of the large intestine. The research concluded that laminitis seems to be the result of fermentation of pasture OF by gram positive hindgut microbes. However, in 2003 insulin had not been proven as a cause of laminitis. Simple sugar levels were not considered in this research. Milinovich et al 2006 gave oligofructose and found a sharp decline in faecal pH (marked hindgut acidosis) and alterations in microbial populations in caecum and large intestine. In the developmental stages of oligofructose-induced laminitis (using bolus doses of 7.5 to 12.5 g/kg by stomach tube), significant quantities of d-lactate (2 to 3 mmol/L) have been observed in the plasma between 4 and 32 h after induction. Van Eps and Pollitt 2009 gave 10 g/kg BW oligofructose by nasogastric tube – all horses developed diarrhoea, pyrexia and tachycardia from 20 hrs. 7.5 g/kg BW oligofructose (a partial hydrolysate of inulin) was administerd via nasogastric tube. All horses had diarrhoea 6 - 24 hours after OF administration, increased digital pulse intensity and weight shifting of front feet 15 - 24 hours after induction. By 6 - 12 hours all horses developed caecal acidosis with pH < 5, caecal pH was lower than baseline by 2 hours. Laminitis was seen in 3 horses between 20 and 28 hours, and as late as 43 hours in the last horse. Histological changes in the feet due to laminitis were first seen at 12 hours in 2 horses, 18 hours in 1 horse and 30 hours in 2 horses. Caecal fluid lactate increased almost immediately. Katz and Bailey 2012 - laminitis tends to develop 24 - 36 hrs following OF administration, earliest histological changes are loss of normal shape and arrangement of the lamellar basal and parabasal cells, with lysis and separation of the lamellar basement membrane. Toth et al. 2010 found that endotoxaemia exacerbated insulin resistance. Insulin resistance appears to be provoked by systemic inflammation, as well as contributing to it (Katz & Bailey 2012). Kalck et al. 2009 administered 5 g/kg BW OF by nasogastric tube after a 6 day introductory period of feeding 1 g/kg OF with oats. 3 out of 8 horses developed developed Obel grade 1 or 2 laminitis. Glucose dynamics were altered but insulin dynamics were unaltered. Other horses were given 7.5 g/kg BW OF in the same manner, 4/4 developed laminitis. Toth et al 2009 also administered 5 g/kg BW OF by nasogastric tube. 2/8 horses developed Obel grade 1 or 2 laminitis. OF induced signs consistent with systemic inflammation. Insulin sensitivity decreased, but acute insulin response to glucose did not increase significantly. Toth et al. 2009 and Toth et al. 2010 found that endotoxaemia and carbohydrate overload (OF) reduce insulin sensitivity in horses. Toth et al 2008 healthy horses injected with LPS endotoxin had reduced insulin sensitivity for 24 hrs after treatment (13/16 horses showed mild colic and leukopenia). If fructan was causing pasture associated laminitis by SIRS, wouldn't all horses would be equally susceptible to hind gut disturbance, not just insulin resistant horses? In every case of OF-induced laminitis, symptoms of systemic illness were seen - increased temperature, diarrhoea, changes to white blood cells and other blood results. These are generally not see with pasture-associated laminitis. Some horses seem predisposed to laminitis while others grazing the same pasture are never affected - why? - endocrine - hormones cause laminitis, but these horses are not systemically ill.
2. We used to think pasture associated laminitis was due to carbohydrate overload, we now know that fructans in grass do not cause laminitis. Horses with PAL have no signs of inflammatory/systemic disease, no raised temperature, no changes in their white blood cell counts, no diarrhoea. Pasture associated laminitis is an endocrine disorder with an abnormal insulin response. 3. Endocrinopathic laminitis is the most common cause of laminitis - Karikoski et al 2011. 4. The insulin models of laminitis (Asplin et al. 2007, de Laat et al. 2011) have shown that the histopathology (changes to cells) in the feet are different between SIRS and endocrine laminitis, shown that low levels of insulin can cause laminitic histopathology, and moved the focus of the cause of pasture associated laminitis away from inflammatory substances in grass (fructans, vasoactive amines) to metabolic/hormonal disturbances (see below). Andy Durham said much the same in his February 2012 webinar sponsored by Boehringer Ingelheim - around 90% of laminitis cases have an endocrinopathic cause (Karikoski et al 2011) - in fact it's probably more than 90% - young, fit, non-obese horses get laminitis less than 10% of the time. Fructans of 5 g/kg BW or more administered by stomach tube in one hit have been used experimentally to cause acidosis in the large intestine, leading to the mucosal barrier being compromised, releasing toxins which are thought to trigger laminitis. At realistic levels of grass intake, fructans do not cause colitis and large intestine mucosal barrier compromise, but low levels of fructans/sugars do cause hyperinsulinaemia in laminitis-prone ponies with EMS and PPID. Grass-induced laminitis is endocrine laminitis. Insulin was infused for 72 hours or until clinical signs of laminitis were seen - increased digital pulses, increased hoof heat over the dorsal hoof wall, weight shifting, lameness (Obel grade 2). All treated ponies developed laminitis in all 4 hooves. Obel grade 1 was evident by 33 h, Obel grade 2 by 56 h. Respiration rate increased from 19 to 36, heart rate increased from 49 to 70 bpm. Rectal temperature remained normal. Basal insulin was 15.7 uIU/ml, glucose 5.2 mmol/l, insulin averaged 1036 uIU/ml. Laminar histology showed elongated and tapered tips to secondary epidermal laminae, disintegrated basement membrane and rounded basal cell nuclei. The research concluded that high carbohydrate intakes, e.g. high NSC diets or lush pasture, could drive insulin levels beyond a tolerance threshold in insulin-resistant horses, causing laminitis. It was mentioned that high NSC diets impair glucose tolerance, and high NSC diets should be substituted with low glycaemic index feeds - it's all about glucose causing high insulin. Glucose being digested in the small intestine, from simple sugars and starch - nothing to do with fructans. "There was no clinical evidence of gastrointestinal involvement and the ponies showed no signs of systemic illness throughout the experiment". Need to remember that unlike humans, horses rarely develop pancreatic exhaustion and are capable of producing exceptionally high serum insulin concentrations. Walsh et al 2009 found that plasma insulin correlated with laminitis grade and that the onset of laminitis was associated with hyperinsulinaemia > 100 uIU/ml. Melody de Laat's research Insulin-Induced Laminitis published by the RIRDC in 2011 states "laminitis occuring in insulin-resistant horses and ponies is often accompanied by the intake of large amounts of non-structural carbohydrate rich pasture." "This increased dietary intake of glucose may play a role in disease development in cases of pasture-associated laminitis." "Further, the insulin model of laminitis necessitates the administration of large amounts of glucose." "Horses rarely become hyperglycaemic, so either the relentless insulin production by the pancreas in response to the glucose contributes to lamellar failure, or the glucose itself may be toxic to the tissues." Insulin sensitive horses subjected to a hyperglycaemic clamp for 48 hrs became hyperinsulinaemic within 4 hrs - mean glucose 10.7 mmol/l and mean insulin 208 uIU/ml. Clinicial signs of laminitis or lameness were not seen, appetite, heart rate and respiratory rate remained normal, haematology and biochemistry blood results were normal other than hyperinsulinaemia and hyperglycaemia. Lamellar pathology (lengthening and narrowing of secondary epidermal laminae, increased mitotic figures, apoptotic bodies, leucocytes in the dermis, but no basement membrane disadhesion) was found in all horses after 48 hrs, in 1 foot in 1 horse, both front feet in 2 horses and all 4 feet in 1 horse. This research confirmed that insulin causes sub-clinical lamellar pathology at levels at or below 200 uIU/ml, and concluded that glucose does not appear to induce laminitis in the abscence of hyperinsulinaemia. Healthy horses were subjected to a prolonged-euglycaemic, hyperinsulinaemic clamp with mean insulin ranging 811 - 1036 uIU/ml. All of the treated horses developed laminitis within 48 hrs, increased digital pulses and episodic shifting of feet was seen by 32 hrs, constant shifting of feet (Obel grade 1) was seen by 41 hrs. All treated horses had no change in blood haematology and biochemistry, heart rate, respiratory rate or temperature. Laminitis was confirmed histologically in 4 feet (3 horses) and 3 feet (1 horse - the lightest in weight). Lamellar changes included mitosis, apoptosis, lamellar lengthening and narrowing, and basement membrane disruption/dysadhesion and were seen as early as 6 hrs from onset of hyperinsulinaemia. The hoof surface wall temperature of treated horses was constantly elevated above control horses, suggesting vasodilation. "Alimentary forms of laminitis are usually associated with overt clinical signs such as depression, diarrhoea or fever, whereas hyperinsulinaemic laminitis is not." So this suggests that endocrine laminitis is quite different to laminitis induced by oligo-fructose/fructan. Horses with OF laminitis will be obviously ill, horses with endocrine laminitis will have laminitis as their primary illness. 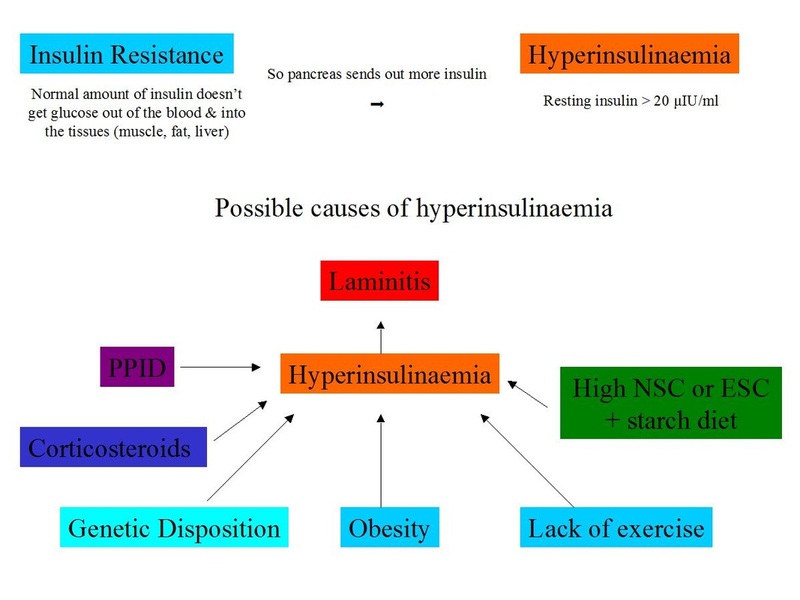 High levels of glucose from high NRC feed is the likely cause of hyperinsulinaemia. Trieber et al. 2006 - elevated serum insulin distinguished ponies susceptible to laminitis from those that weren't. Positive correlation between mean ESC and mean insulin concentration in grazing horses (see p 37). Higher glucose and insulin concentrations appeared to correspond with increases in simple sugar intake on pasture. So pasture associated laminitis is almost certainly endocrine - but could it be due to fructans? In their review of recent advances and current hypotheses on the pathogenesis of acute laminitis (2012), Katz and Bailey say: "excessive ingestion of carbohydrate (i.e. starch or possibly fructan from pasture) is one of the more common causes of laminitis,". (Given that Karikoski found that 89% of horses presented for laminitis at a first opinion/referral equine hospital had endocrinopathic laminitis, "common" relating to carbohydrate overload might be disputed!). Note that they say "possibly fructan from pasture" - there is no proof that fructans in pasture cause laminitis. OF overload in the hindgut causes a severe and rapid change in the hindgut bacterial populations, particularly a rapid proliferation of Gram positive bacteria, which produces a profound drop in pH as well as profuse diarrhoea. Endotoxin has been found in horses with OF induced laminitis. A significant proportion of laminitis cases occur at pasture. Pasture can contain large amounts of fructans - Longland & Byrd 2006 - which may be enough to cause changes in the hindgut microflora - Crawford 2007. But recent debate questions whether the OF overload model reflects fructans in pasture (inulin is not the main form of fructan found in pasture). Kalck 2009 induced laminitis in 3/8 horses with 5 g/kg BW by nasogastric tube. OF overload causes laminitis in any type of horse. Pasture associated laminitis generally occurs in horses with insulin resistance, and pasture associated laminitis is considered by many to be a form of EMS - horses that get laminitis from eating grass are generally either overweight or have regional adiposity and test positive for EMS or PPID (particularly when dynamic tests are used). Increases in grass NSC levels tend to coincide with increased incidence of pasture associated laminitis - Longland & Byrd 2006, Watts 2004. Grazing on pasture increases plasma insulin concentrations depending on the metabolic status of the horse - Geor 2009. Katz & Bailey suggest that feeding inulin also increases plasma insulin concentrations in IR individuals - Bailey 2007 and Borer 2012 - but we show (below) that this cannot be concluded from either of these papers and that ESC (particularly glucose) was the more likely cause of increases in insulin concentrations in IR ponies. de Laat's 2011 research showed that laminitic changes in the feet happen at insulin concentrations of 200 uIU/ml or lower. Walsh et al 2009 found that the onset of laminitis was associated with hyperinsulinaemia > 100 uIU/ml. Insulin does not appear to play a role in the OF overload model (Milinovich 2006), but horses with pasture associated laminitis generally have insulin concentrations above normal, or an above normal response to a dynamic test such as the oral glucose test. Katz and Bailey conclude "In pasture-associated laminitis, although this condition may have multiple contributors, it is highly likely that hyperinsulinaemia and/or IR play a significant role; the effects of pasture fructans being fermented in the large intestine may not be sufficient to cause laminitis without other metabolic triggers such as the additional effects of insulin." It may be that rapid fermentation of fructans contribute to the development of laminitis - but research adding 3 g/kg BW inulin making a total of 6.1 g/kg BW fructan (Bailey et al. 2007, Crawford et al. 2007) found no signs of lameness or laminitis. Bailey made no reference to any clinical symptoms being observed. Crawford made no reference to any clinical symptoms being observed, other than transient increases in digital pulse pressure in 1 or 2 limbs, a slight decrease in dung pH and increase in dung amines which could have been attributable to the sudden change of diet from hay to Readigrass. 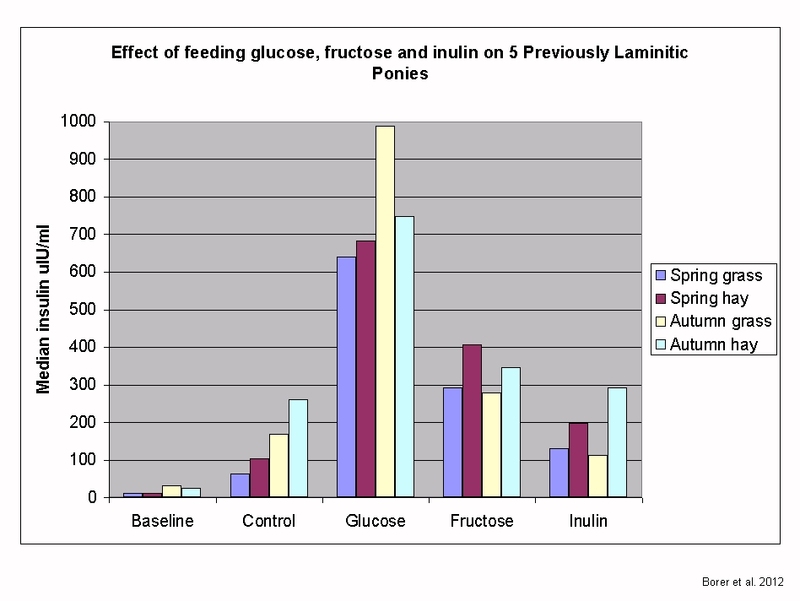 Fructose feeding in other species contributes to IR, but there is no evidence (at the moment) that fructans are digested to fructose in the horse. So where did the idea that fructans might contribute to endocrine laminitis come from? How could fructan overload lead to above normal glucose and insulin? "Periods of high pasture nonstructural carbohydrate content (which includes simple sugars, starches and fructans) appear to correlate with peak periods of laminitis incidence." In September Bailey et al. tested insulin and glucose in previously laminitic ponies (LP) and never laminitic ponies (NP) after they had been eating grass (WSC 18.2%, fructan 13.8%, ESC 4.4%) and hay (WSC 6.6%, fructan 3.4%, ESC 3.2%), and found that LP had a greater insulin response than NP to both grass and hay. The grass appears to have been sampled before 10 am (when ESC is likely to be lower than later in the day). Presumably it is possible that ESC levels in the grass could have been considerably higher recently, and that ponies grazing high ESC grass would have correspondingly high insulin levels. No mention is made of whether the LP had regional adiposity - they were not obese but they were less insulin sensitive than the NP therefore clinical signs of EMS might be expected. EMS horses habituated to eating high NSC diets often have hyperinsulinaemia, even if fasted before the blood is drawn. They suggest that fructan could be a major factor in the development of hyperinsulinaemia in LP at pasture - but no explanation is given as to how, other than that fructan may be broken down by bacteria in the stomach and small intestine releasing fructose (Coenen et al 2006). Although it is suggested that fructose can lead to insulin resistance, no explanation is given for how this would lead to hyperinsulinaemia. 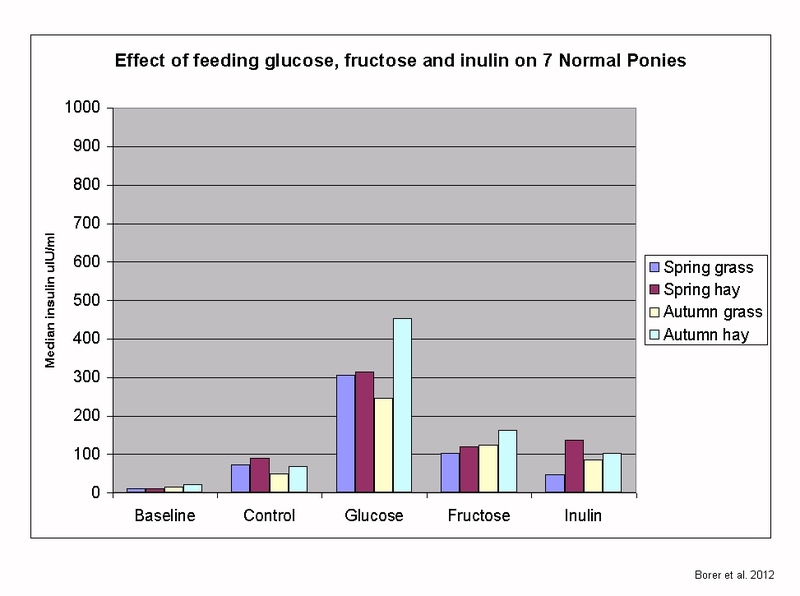 They show that insulin resistant ponies (LPs) secrete more insulin in response to glucose than NPs (insulin-modified IV glucose tolerance test), and that fructose tends to cause less of an insulin response to glucose. We know that insulin resistant ponies have a greater insulin response to glucose than normal ponies - this would appear to explain every finding in this research. In March LP and NP ponies were stabled and fed hay for 2 weeks, then had their diet abruptly changed to 2/3 hay and 1/3 Readigrass - a freeze-dried perennial ryegrass which is high in sugars and fructan and “has an energy level equivalent to cereals or medium energy compounds” according to Spiller’s website - plus 3 g/kg (bw) inulin, a form of shorter-chain fructan, fed in 3 meals/day, which increased the total fructan in the diet from 4.1 g/kg (bw) to 6.1 g/kg (bw). These figures seem a little surprising - 4.1 g/kg bw fructan would be the equivalent of a 20.5% fructan hay for a 500 kg horse eating 2% bw/d - this is very high - a quick look through many hay analyses carried out by Equi-Analytical with hay samples from the UK, Canada and USA showed that the highest fructan % DM was less than 15% DM, most were below 10% DM. It then seems odd that adding 3 g/kg (bw) fructan plus a supposedly high fructan freeze-dried ryegrass only increased the fructan in the second diet by 2 g/kg (bw). 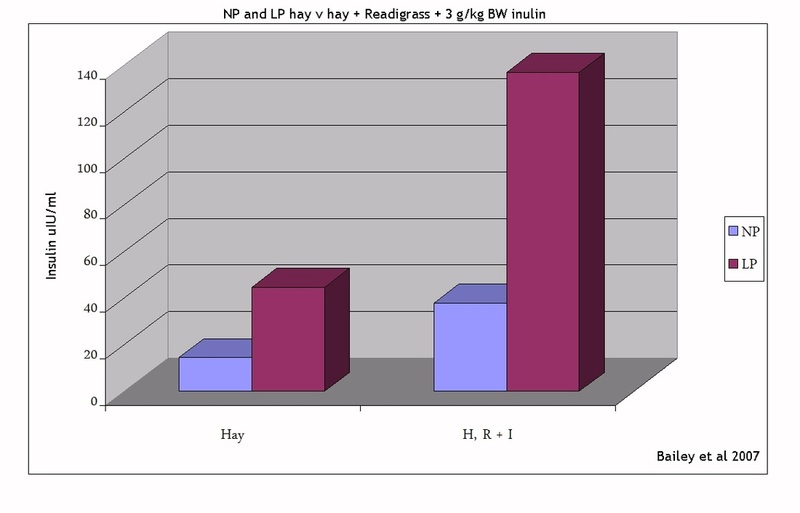 Again, LP had a greater insulin response to both hay, and hay with Readigrass and inulin, than NP. No ponies showed any signs of laminitis or lameness. No mention is made of any pony having diarrhoea or showing increased heart rate, respiration rate or temperature. Bailey et al. conclude that the LP had an exaggerated response to fructans - how can this conclusion be made? No controls were used - i.e. no horses were given the 2/3 hay 1/3 Readigrass diet without the inulin (fructan), therefore it is surely impossible to correlate any response to the inulin (fructan). All that can be concluded is that previously laminitic ponies, who were less insulin sensitive, had a greater insulin response to all diets, than never laminitic ponies. Crawford et al 2007 followed the same protocol as Bailey - normal ponies (NP) and laminitis-prone ponies (LP) were stalled and fed hay with a fructan level of 4.3 g/kg BW for 2 weeks, then for the third week the diet was abruptly changed from 100% hay to 2/3 hay and 1/3 Readigrass (a freeze-dried ryegrass with high sugar and fructan levels and the equivalent of a medium energy feed according to Spillers) plus 3 g/kg BW inulin (DP 2-60), giving a total fructan content of 6.15 g/kg BW/d, divided into 3 meals. Again there were no controls - no ponies were fed Readigrass without inulin - therefore results recorded could be attributed to either the Readigrass or the inulin. Blood and dung was tested on the hay diet and 1, 2, 3 and 5 days after changing onto the Readigrass and inulin diet, at 5 pm - 1 hr after being fed (Borer et al 2012 found insulin peaked 2 - 4 hrs after ponies were fed). Insulin and glucose were not tested. No pony showed any signs of laminitis or lameness, and there was no difference in hoof wall surface temperature with diet or between groups. 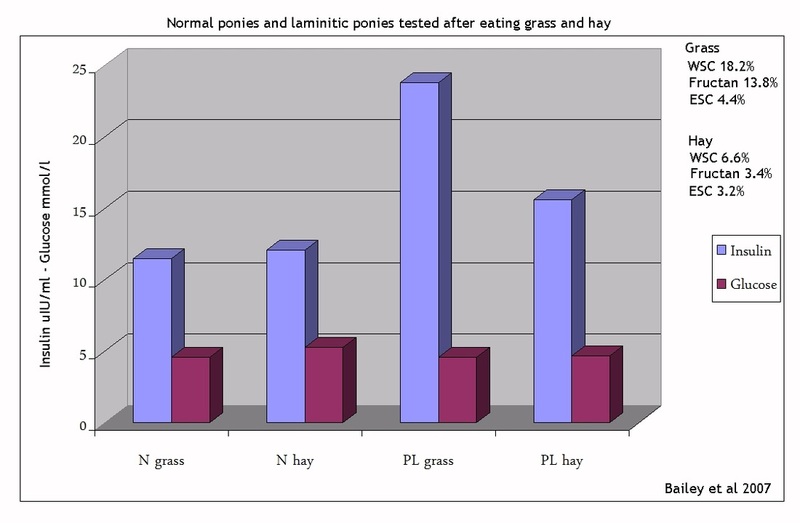 No changes to plasma lactate (so intestinal mucosa not compromised), no clinical symptoms, no change in plasma amines, slight increase in amines in dung with Readigrass/inulin diet (amines are produced when dietary protein is fermented in the large intestine, Readigrass is a high protein feed), slight decrease in faecal pH from 6.89 to 6.18 after 2 days on the Readigrass/inulin diet which rose slightly but remained below the hay only pH. Crawford et al. concluded that the addition of fructan resulted in decreased dung pH and increased bacterial production of amines. However, with no control horses fed Readigrass without inulin, these changes surely cannot be attributed to the insulin/fructan, and could have been caused by changing 1/3 of the diet suddenly from hay to Readigrass, a high sugar, high protein feed. The paper states “This indicates that the threshold for inulin inclusion, at which point hindgut alterations lead to significant leakage of these factors into the circulation, is somewhat above 3 g/kg of BW” - but see below - these ponies actually ate 6.1 g/kg BW fructan per day with no symptoms of illness. What these 2 papers from 2007 do appear to show us is that ponies, both never laminitic and previously laminitic, ate 6.1 g/kg BW fructan per day, split into 3 feedings, for a week, with no signs of lameness or laminitis, presumably no diarrhoea or increased heart rate, respiration rate or temperature, just a slight decrease in faecal pH (Crawford et al. 2007) on day 2 of inulin feeding which started to rise from day 3. 6.1 g/kg BW/day is more than the 5 g/kg BW used by Kalck et al 2009 which induced laminitis in 3 out of 8 horses, but which was administered all in one go straight into the stomach by nasogastric tube - which could not happen under normal eating conditions. Assuming a horse is eating 2% of its bodyweight/day, 6.1 g/kg BW would be 3,050 g fructan, or a 30.5% fructan grass or hay. Yes, grass is seen with fructan levels this high and higher - but looking at average grass samples, most grass appears to contain considerably less fructan than 30%. Fructan and sugar levels change throughout the day - the levels that tend to get reported are likely to be the peaks - during the night and early hours of the morning, sugar and fructan levels will generally be considerably lower than peak levels. Also grass that is stressed and therefore storing fructans is quite likely to be short - it is likely that it will be harder for horses to eat large quantities of it, than lusher faster growing grass. In 2012 Borer et al 2012 showed that feeding glucose significantly increases the insulin response, feeding inulin (fructan) doesn't - and a control was used. 7 normal (NP) and 5 previously laminitic ponies (PLP) were fed hay (baseline), Happy Hoof (control), and Happy Hoof plus 1 g/kg glucose (Dextrose monohydrate), 1 g/kg BW fructose and 1 g/kg BW inulin (Orafti inulin - a mix of oligo- and polysaccharides with beta-1,2 bonds with DP 3 to 60, extracted from chicory root) for 3 days after being at pasture (but brought into barn with hay the day before testing) or in a barn with timothy hay for 7+ days in May-June and Oct-Nov. Blood was tested before and for 12 hrs after feeding. No clinical signs of laminitis were seen at any point, the only adverse effect noted was 1 PLP had softened faeces when fed fructose but no signs of abdominal pain were seen. Note: ponies showed no clinical symptoms of PPID and tested negative to DST, but ACTH was not tested. Horses at grass would presumably have had more exercise than horses in barn/on hay. Results are median, i.e. the middle result, rather than the average, and only 7 NP and 5 PLP so very small numbers. Pasture NSC was not analysed. Insulin sensitivity was not established. Note also with all of the above experiments that making sudden changes to the diet may not represent "real life", and that many factors have to be considered, e.g. active transporters for glucose and fructose in the small intestine (SGLT1, GLUT5, GLUT2) may not be sufficient to absorb all sugars following a sudden change, but may adapt with time/slow introduction. So how does grass cause laminitis? simple sugars or ESC and probably starch in grass - specifically glucose (starch is converted to glucose in the small intestine). May be influenced by PPID and increased ACTH Aug - Oct in all horses. In addition, corticosteroids including dexamethasone increase insulin concentrations, and obesity and lack of exercise may affect insulin. Anecdotally, diarrhoea, gas colic and other abnormal signs are sometimes seen in horses grazing pasture, particularly after unusual or large ingestion of grass, e.g. if a horse escapes into a field of long grass, or following a flush of grass growth. We know that high sugar levels precede fructan synthesis, and that SGLT1 transporters transport ingested glucose into the horse from the small intestine. Hoffman 2009 suggests that, if an increase in SGLT1 transporters lags behind an abrupt increase in sugars in the diet (as it does in mice), "sugar transport would be inadequate, thus exacerbating hydrolyzable carbohydrate overload to the hind gut" - so perhaps it is sugar reaching the hind gut that causes the clinical signs seen. How much NSC/WSC/ESC/fructan is in grass? Sugar and fructan concentrations change throughout the day and year, depending on sunlight intensity, environmental temperature, availability of water, availability of nutrients (fertilizer), stage of growth. Grass that is analysed for fructan and sugar levels is often not grazed, therefore may not represent grass that is grazed. Orchard grass in drought conditions in Mediterranean had fructan 350 – 400 g/kg DM in stem bases. WSC changed from 160 – 240 g/kg within 3 hours. Germany 10 horse farms Apr – Nov fructan ranges 18 – 57 g/kg DM – highest May, lowest Aug, intermediate Oct.
3 year study 9 sites Germany, Ireland, UK, Norway & Sweden WSC ranged < 100 g/kg to > 385 g/kg DM – highest at cooler temps. Over 2 growing seasons in UK fructan ranges 75 – 279 g/kg being 55 – 75% WSC, sucrose 16 – 22% WSC, fructose 6 – 12% WSC, glucose 3 – 10% WSC. Simple sugars recorded up to 10% DM. WSC ranged 1.6 to 12.7% (WSC cannot be less than ESC - therefore this must be testing variance). Ince JC, Longland AC, Moore-Colyer MJS, Preservation of Timothy, meadow fescue and two varieties of perennial ryegrass as hay: effect on nutrient content. Grasses sown in April were cut 5 cm above soil level in August and analysed. All figures DM. Longland et al 2012 - pasture contains varying amounts (0 to ≥ 200 g kg DM) fructans. Fructans in 4 species (Phleum pretense, Festuca rubra, Dactylis glomerata, Lolium perenne) managed for grazing and sampled April to November and managed for conservation and sampled in July ranged from 83 to 299 g/kg DM (HPLC) with an average of 154 g/kg. Analysis by colorimetric methods, considered not as accurate, found fructan levels of 5 to 238 g/kg DM. WSC in perennial ryegrass in full sun on a spring day rose from 250 g/kg at 5 am to 310 g/kg at 1-3 pm declining to 180 g/kg by 11 pm (Longland 2005). MAFF 1992 late spring/early summer pasture WSC content can approach 300 g/kg WM, although levels of 200 - 220 g/kg DM WSC may be more usual. As soon as grass is cut for hay it starts to lose sugar, due to respiration (carbohydrates are converted to water and carbon dioxide). Respiration will continue until the grass is less than 40% moisture - the longer hay takes to dry, the more non-structural carbohydrates are lost. Timothy grass was cut and wilted for 24 hours at 15'C or 20'C in either darkness or light. Soluble protein, glucose and starch contents decreased, amino acid, sucrose and fructose contents increased, and fructan content was unchanged. WSC in grass is reduced by respiration and hydrolysis after cutting (Lundén Pettersson & Lindgren, 1989, McDonald et al. 2002). Fructan may be hydrolysed to fructose (McDonald et al. 2002). Wylam (1953) found that 64% of fructan was broken down by the time the dry matter content of grass reached 78%. How reliable is fructan analysis? Wet chemistry analysis is the most accurate. NIR gives an estimate according to calibration against wet chemistry results. According to Katy Watts, wet chemistry, as carried out by Equi-Analytical/Diary One (for some of their analyses - not all) is the most accurate method of analysing WSC, ESC (and therefore fructan = WSC - ESC) and starch. Longland et al 2012 compared fructan analysis by high-performance liquid chromatography (HPLC), used for research purposes, and a comercially available colorimetric method and found that the colormetric method understated total fructan content - 83 - 299 g/kg DM HPLC compared to 5 - 238 g/kg DM colormetric. How much fructan could horses consume? Crawford et al 2007: It has been calculated from some studies of pasture consumption (Longland and Byrd, 2006) that horses can commonly consume between 2.1 and 3.5 kg of fructans per d (4.2 to 7.0 g/kg of BW) for a 500-kg animal. This calculation was based on DM intakes of between 1.5 and 3% of BW per day, and a peak fructan content of around 25 to 30% of DM, although greater DM intakes have been reported (Longland and Byrd, 2006). Therefore, even at the lower end of this range of DM intakes, the total intake of fructan at certain times of the year on certain pastures could be considerable. Annette Longland presented at the Equine Science Society 2011: mature ponies not in work ate an average of 3.8% BW DM mixed grass/legume pasture over 6 weeks - from 3.4% BW higher quality pasture (DE 2.9 Mcal/kg) to 4.2% lower quality pasture (DE 2.3 Mcal/kg) - however, these were estimated figures calculated from changes in body weight. The NRC 2007 suggests an intake of 2 - 2.55 % BW/d for grazing adult non-lactating horses. Voluntary DM intakes of fresh forages by horses and ponies have been measured and values ranging from 1.5 - 5.2% BW/d reported - Marlow et al 1983 & as above. Higher values tend to be ponies. Horses are regarded as averaging 2.2% BW/d for mature horses and 2.5 - 3% BW/d for lactating mares. Association of season and pasture grazing with blood hormone and metabolite concentrations in horses with presumed pituitary pars intermedia dysfunction. J Vet Intern Med. 2010 Sep-Oct;24(5):1167-75. Longland AC, Dhanoa MS, Harris PA. Comparison of a colorimetric and a high-performance liquid chromatography method for the determination of fructan in pasture grasses for horses. TÓTH, F., FRANK, N., CHAMEROY, K. A. and BOSTON, R. C.
Tóth F, Frank N, Elliott SB, Geor RJ, Boston RC.